Mix filling ingredients with the marinade sauce until the sauce is incorporated into the mince. Cover the mixture and rest in the fridge for 3 hours. 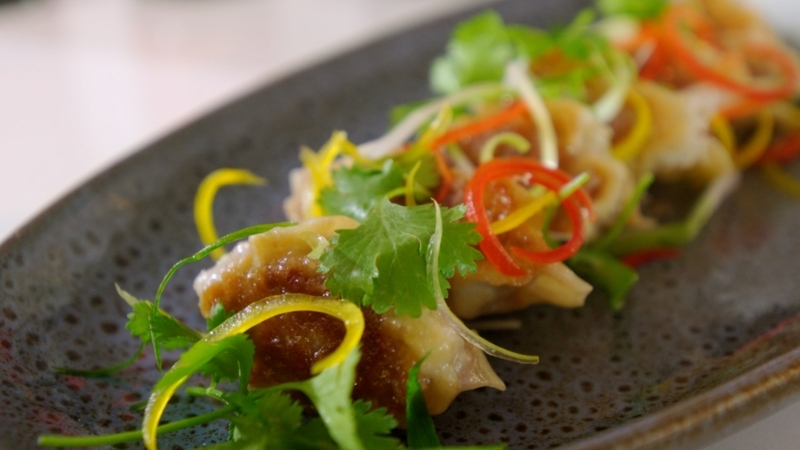 To wrap the dumpling, take one dumpling skin and scoop about 1 tbsp of pork mixture into the centre of the wrapper. Dip your finger into a bowl of water and wet the wedges of the dumpling wrapper. Then, pinch the sides of the dumpling skin to seal it up tightly with your fingers. Heat frying pan with oil, place dumpling flat-side down, add room temperature water to one third of the height of dumpling. Turn to low heat and cover with lid. Cook for approximately 10 minutes or until water dries out. Remove lid and drizzle with oil. Turn to high heat and cook for further 2 minutes or until bottom side is golden brown and crispy.